Ferdinand is the classic story of the giant bull with a heart to match, so if you add in the deep and smooth voice of John Cena, if you're anything like me, you'll instantly fall in love with this movie. Just like John himself, Ferdinand is the biggest bull in the yard which leads those who don't know him to think that he an aggressive and how you would stereotypically see a matador, however that's where the most powerful message of this movie shines right through when Ferdinand is really a loving, caring and sweet bull and isn't afraid to be himself - SPOILER, there's your message and it's exactly why I want you to sit down with your children and watch this movie. After running away from the bull yard as a young calf trying to break free from the usual path of a bull, Ferdinand is taken in by a sweet, young farmers daughter where he can be himself - free to sniff the flowers, run free and be the loving and kind bull that he is. That is until he goes into town where he perceived far from his true character by the townspeople, sent back to the bull yard and expected to be like all the other bulls. After watching John fight in the WWE ring for over a decade, it was so incredible to see a role that really is the epitome of his personality. Bullied when he was younger, John learnt the hard way that many will judge you from the outside before they even begin to know the inside. Through his career, he has done just as Ferdinand did - assert himself and be so completely confident in being EXACTLY who he wants to be and been an absolute inspiration to millions of adoring fans around the world because of it. I was given the absolute pleasure of sitting down with John while he was in Sydney last year for the release of Ferdinand and as I got to see the movie before I met him, the parallels between his character and his personality were so similar. Watch more below! I can't wait to sit down and watch Ferdinand with the kids. Madi is at that age now where she can begin to realise the value of a powerful message like this and at such an influential age where they soak everything in (because who knows what she tells her Prep teacher!) this is a great mindset to learn now she's in Prep and really starting to assert who she is. Then there's Max who will certainly be asking for it to be played time and time again because of it's colourful characters, plus, it's animals and what 2 year old doesn't like a movie filled with animals. In a world filled with judgement and bullying, Ferdinand captures the essence of breaking free from what really should be the norm, teaching others to not judge a book by its cover and sends a very strong anti-bullying message to those who watch, because in the end, we all know that everyone is different and we should learn to embrace everyone as they are. 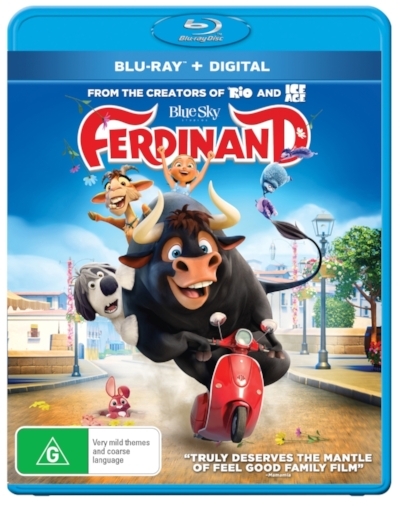 Ferdinand, New to Blu-ray™, DVD & Digital is now available for you and your family to enjoy. I think even us big kids could get a lot out of this movie too, because you're never too old to learn a pretty epic lesson from a children's movie. Really, if you think about it, when you sit down with your kids now to watch a movie that you watched a child, did you see the powerful message it was trying to share with you - I sure do now! Time to grab the popcorn, cuddle in with the kids and fall in love with Ferdinand!